So this isn't really a movie or drama, but I figured it fell close enough. 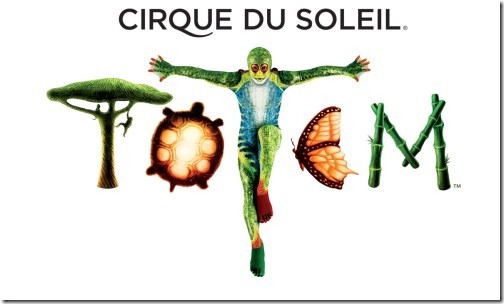 This past Tuesday I went to see the Cirque du Soleil show in SF, by AT&T park. It was entertaining, and the first ever of their shows for me. I wasn't wowed, but I thought the costumes, music, and acrobatics paired beautifully. While I've seen the Beijing Acrobats do even more amazing stuff, this was designed more as an entertainment show for all ages rather than simply an acrobatics display. They've got clownish acts paired with more dangerous, high level shows. My favorite was a segment involving six girls riding 10-foot-high unicycles tossing and catching bowls with one foot. It was quite thrilling to watch. The show took place on an arena inside a giant tent they set up, called the Grand Chapiteau. It's got slightly inclined seats and is perfectly temperature controlled, so no worries about cold or hotness. My one gripe is that the incline wasn't steep enough. Often, the person in front you would block the majority of your view. Totem's theme is evolution, so they've got everything from beach men to monkeys on the stage. The costumes are fun and colorful. Some parts however are a bit cheesy and over-dramatic, such as the chanting music they kept using. 1. Definitely try to get a lower-level seat closer to the stage (the 100s, not the 200s). The sales associate I talked to said that second level will give you a better view, but that was not true. Firstly, on the second level you're quite a bit farther away from the stage. Also, they have these electricity poles around the inside between the lower and upper sections, which can block your view of the stage at various angles. While it's not good to get a super angled seat in the front, it's much better to be slightly angled and closer to the stage than not as angled but farther away. Cause when you're closer up, the athletes actually swing over you, which is very cool. 2. You can actually move to unoccupied seats not in your section (or closer up in your section). I saw lots of people do that after the intermission, because by then nobody checks. So if you're a small party, keep an eye out for empty seats in better sections. 3. Feel free to bring your own food/drinks. Their concession lines are super long and very overpriced. They don't do any bag checks, so you can pack stuff with you. 4. They do group ticket prices for over 12 people. Call them at the 800 number, and if you order the tickets by Fedex delivery instead of electronic delivery, you don't have to pay a per-ticket processing fee (I think it's around $5-10). Fedex may cost more for delivery (50 vs. 5) but it proved worthwhile for our large party. Tickets arrive usually in 3-5 days. So I wish I'd known some of this before booking and planning the event, but hopefully this will help some of you who are also new to Cirque.